Dumped, Drunk and Dalish: Reader Questions: God or No God? I get a fair amount of mail, questions, and comments, and one of the most common questions I get (especially lately) is, "Why do you call Solas a god?" And they then remind me that he's not actually a god. First off, sometimes I call him a god because it's amusing and fun, and I'm being cheeky. But most of the time? I call him a god because it's essential to understanding him, it's a vital part of his backstory, and it's... really freaking cool. He was one (or was believed to be one by the masses), way back among the Evanuris. He became, for thousands of years, the most famous mythological villain in the history of Thedas. To me, it remains fascinating that Solas is Fen'Harel, and I still think it will be relevant in a very specific way if and when we get Dragon Age 4. That duality and darkness, that sense of bleak absolutism, is for me a vital aspect to his character and story—for example, when he mindwipes Cole right in front of us in a key banter scene, or when he executes the mages who corrupted his friend Wisdom (I mean, he just absolutely obliterates them; it's genuinely scary and also a clear signal that he has been covering up just how powerful he actually is for most of the Dragon Age: Inquisition story). There's certainly more of the Wolf there than Solas would like people (especially a romanced Lavellan) to see. And that ties directly into his god persona. Last but not least, after "Trespasser," I tend to call Solas a god because it's honestly, to me, the most accurate description of who and what he is, especially at the current juncture in the game (which is of course somewhat ironic—he's come full circle!). For a look at the facts of Solas's godhood, here's my imaginary conversation with Solas on this topic. ME: Solas! Hi! You're A GOD! SOLAS (sighs): I am not a god. I was never a god. It was a lie of the Evanuris, perpetuated in their lust for power. ME: Well, I think you're a god. SOLAS: I am no such thing. SOLAS: This is becoming wearisome. ME: Sorry. I'm kind of starstruck right now. SOLAS: Needlessly so. As I said... I am not a god. ME: Have you seen your armor in "Trespasser?" Because. Dude. I'm just sayin'. SOLAS: Armor is a vital necessity in times of danger and conflict. SOLAS: Perhaps an elfroot tonic may be in order. ME: Look... not to be rude, but... you know, you're exactly a barrel of laughs. SOLAS: So I have occasionally been informed. ME: It's just disappointing. A little. I've been such a fan, you see! ME: I thought you would be... maybe a little more amusing? SOLAS: I am not, as a rule, typically bent on amusing people. ME: Yeah, I get that. SOLAS: Although I see little purpose in discussing it. ME: So... back to the god question. SOLAS: Again, I must insist that I am not any such creature. ME: They worshiped you? And the others? SOLAS: They were misguided enough to do so at the time. ME: And you were magically super-powerful? SOLAS: I suppose when measured against most mages today, I must agree. ME: And you were immortal? ME: And you freed the slaves, thousands across Thedas? SOLAS: My conscience could allow me to do nothing else. ME: And you imprisoned the Evanuris and Forgotten Ones as tyrants? SOLAS: In justice and punishment for their crimes, yes, I did so. ME: And you created the Veil? SOLAS: I did, to my current regret and sorrow. ME: So, like, all the legends and tales and stories about you and the others... are actually about people who existed? SOLAS: Alas, yes, although the tales themselves have become twisted and false. ME: Let's face it, you do have powers in the Fade that are pretty much unprecedented, right? You can't argue with that one. 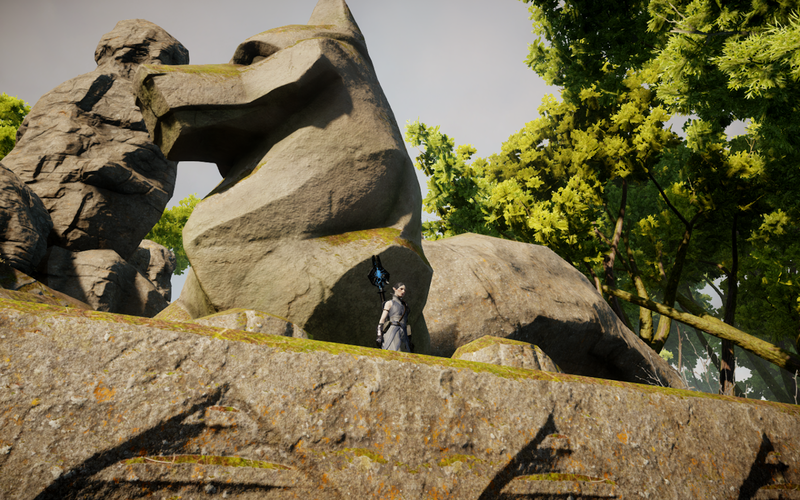 ME: And all those wolf-statues across Thedas—those are of you. SOLAS: They are merely unfortunate representations of the symbol of fear that I became. ME: Still. It's kind of cool. SOLAS: It is not... what was the term? ME: Cool. As in, awesome. SOLAS: Your way of speaking is curious. It is swift and shallow and almost Orlesian. 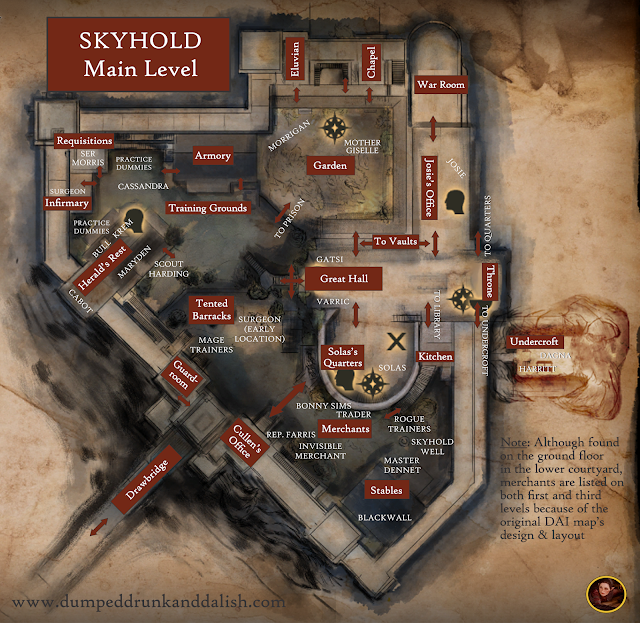 Have you been to Halamshiral? ME: I'd love to go there. But I don't think they'd let me in. I'm kind of a dweeb. SOLAS: I will have to refrain from expressing an opinion, as I am unfamiliar with that term, as well. ME: Let's move on. All this stuff with you and the Evanuris took place thousands and thousands of years ago... and you were actually there? ME: And you still look like this? SOLAS: Did you just... bark... at me? ME: It's an expression of appreciation. ME: Back atcha. Um. Sorry. Wait! I remember: De da'rahn. SOLAS: 'Ma neral. And there is no need to apologize, da'len. ME: Sorry. I mean, not you. I'm just kind of plotzing right now. You called me da'len! ME: This means you're like my Obi-Wan! And I can totally call you "hahren" back now! SOLAS (sigh): Of course. Yes. Feel free to do so. SOLAS: Sathem lasa halani, da'len. ME: (sighs) Okay. Moving on. So. Right now, at this very moment, you can turn people to stone with an eyeblink? SOLAS: Fenhedis! You have heard nothing I said. SOLAS: You make me sad. ME: Tel abelas. Seriously. And if it helps, you're not alone. My family would totally agree with you. To sum up, let's enumerate: Immortal, lived for millennia, unbelievable magical abilities, spawned countless tales and legends, and he can currently turn whole armies into stone with the blink of an eye. To me, while Solas may dissemble and murmur, "I'm not a god, it's just PR," I look at the list above and feel like that's all just semantics. When it comes right down to it, for me, Solas was a god. And Solas is still a god. -cannot remember the exact codex entry..
"His supposed betrayal of both clans of gods by sealing them away in their respective realms, never again to interact with the mortal world..."
So...... perhaps in the time of Andraste... Fen'Harel was a lover of hers? Much like he and a Dalish Inky are in DAI. Any thoughts on the possibility of them coming together and quite literally recreating everything? I know it's far fetched, but for those of us so affected by their relationship, it would be an amazing end. That's a great callout! Andraste actually lived after Solas went into uthenera, but it's not impossible that he may have had feelings for her from the Fade (I personally think he may have had a romance with her while walking in the living body of Shartan, her friend and elven advisor). I also do think the connections between Solas and the Maker are really interesting, and have to be deliberate! I don't think Solas IS the Maker, exactly, but I love that the Chantry really doesn't have a clue -- so much of what Solas did, they attribute to the Maker instead. Which I'm sure amuses Solas.